Busuanga, Palawan - Local leaders of Busuanga immensely appreciated the 15 nebulizer units and 6 generator sets donated by Sagip Kapamilya for the residents in their villages. “Ang Sagip Kapamilya ay tunay na aming Kapamilya. Hindi sila nagsasawa na patuloy kaming gabayan sa aming pagbangon”, said one village leader during the simple turn-over ceremony at the Municipal Legislative Building in the afternoon of September 18, 2015. The recipient 13 barangays namely: Salvacion, New Busuanga, Old Busuanga, Cheey, Kiwit, Concepcion, Santo Niño, Panlaitan, San Isidro, Quezon, Maglalambay, Sagrada, and San Rafael, were awarded one (1) unit of nebulizer each while barangay Buluang, a remote community in Busuanga, Palawan that has high incidents of respiratory illnesses, was awarded two (2) nebulizers. Also, barangays San Isidro, Santo. 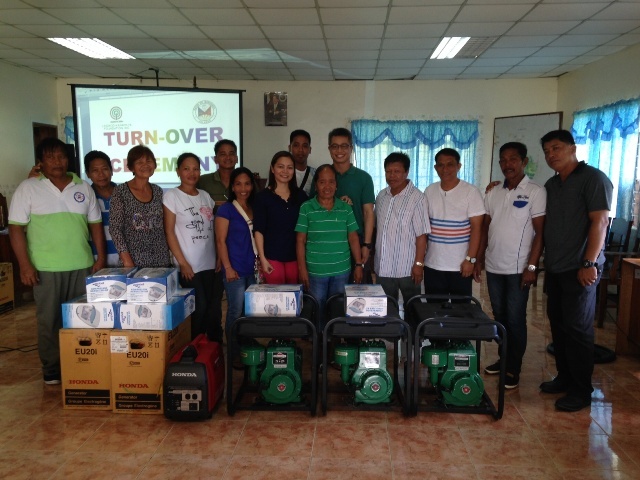 Niño, Maglalambay, Bogtong, Buluang and Quezon were also given one (1) generator set each. “Itong mga bagong kagamitan na ipinagkaloob ng Sagip Kapamilya ay malaking tulong po ito sa aming lahat dito sa Busuanga,” said Vice Mayor Elizabeth Cervantes who graced the modest activity. Busuanga is one of the areas that were severely affected by super typhoon Yolanda (International Codename: Haiyan) in November 8, 2013 wherein ABS-CBN Lingkod Kapamilya Foundation (ALKFI) has been continuously conducting different humanitarian interventions, which include programs on health, education, and livelihood, for the communities. It should also be remembered that on February 12, 2015 Sagip Kapamilya turned over to DepEd-Busuanga District twenty one (21) newly-built and fully furnished public school classrooms in nine (9) different school sites around the island municipality. The project was another Bayanihan initiative of various stakeholders, like the Armed Forces of the Philippines (AFP), Department of Education (DepEd), Department of Social Welfare and Development (DSWD) and Busuanga PNP Office, helping Busuanga in its rehabilitation efforts after super typhoon Yolanda devastated the island municipality two years ago.